We take care of breakfast and dinner in camp once the ride begins and will have ride food and a lunch stop on the route. Water stations are on course but it’s adventure bikepacking so don’t be fooled because you have awesome food and beer at camp. Take advantage of the ride food we offer and be prepared for a level of on-route self-sufficiency. Our ride food partners are Honey Stinger and Nuun Energy. If you’re sensitive to ride food and there is a particular brand you like or drink mix that doesn’t upset your stomach, bring it. Also, don’t forget to tell us about any dietary restrictions. Camp meals are a big thing on the Rambles and we want to make sure you have plenty of the right food to eat. Make sure to add whatever meal type you’re after when registering. Feel free to bring one duffle of post-ride clothing/personal items. This could be a heavier jacket for camp, clean clothes for the end of the ride, towel, wipes, whatever. Keep it in a small or medium-sized duffle or pack. How small? Think under a seat on an airline small. If you bring an Army duffle, just be prepared for 3 days of heckling. These items will be loaded each morning and transported to camp each day. We cannot guarantee access to these bags during the ride however so plan accordingly. For what to carry on the bike, think of the Ramble as consecutive over-nighters rather than an extended tour. You’d pack different right? No need for cooking gear or main meals. No need for heavy, camp-time clothing. No need to carry things you might need “just in case”. Don’t forget your helmet though. Do pack on the bike any personal items you’ll need (medications, sunscreen, cameras, etc.). Pack your shelter and sleeping kit. 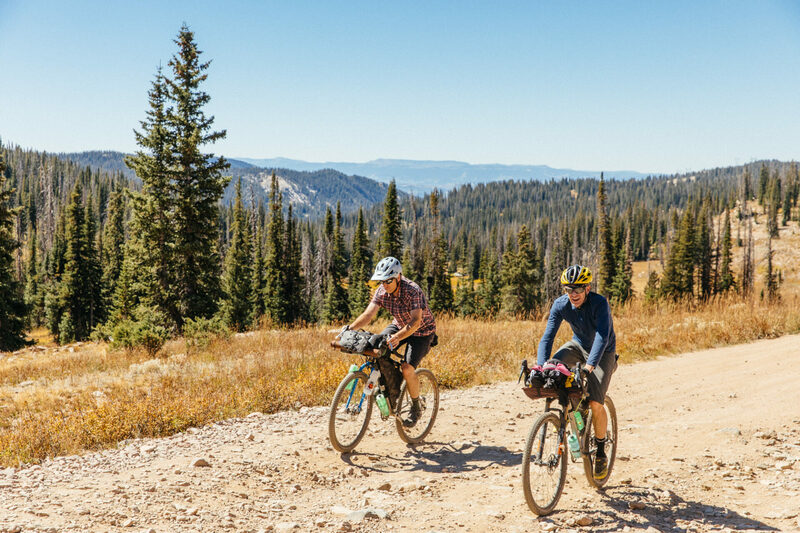 Big Agnes makes a wide range of gear perfect for bike packing. Bring layers for stops or weather. Pack a hat. Pack lights. Carry ride food. Be prepared for mechanicals and flats with a basic road-side kit. We have a full toolkit and repair items at camp. The goal is to be self-sufficient enough to move from camp to camp with the ability to stay comfortably on the route if you had to. On the bike, this fits into a seatpost bag, frame bag and a handlebar bag and typically a 10-15 pound load. A word of advice here: pack light. We take the supported moniker serious so try to fit gear into your camp bag. You can easily pick out return Ramblers: they are the folks with the lightest bikes. Carry the equivalent of four large water bottles worth of water. How you do that is up to you: bottles, reservoirs, collapsible carriers, etc. It’s up to you whether to carry your mess kit on the bike or in your camp bag. You don’t need much: bowl and/or plate, cup, and utensils are all. You know what the number one forgotten item is on the Ramble? Mess kits. Don’t forget. Tent. Big Agnes Fly Creek HV UL2 is a favorite. HV is high volume so you can sit up, UL is ultra light for you gram counters. What some advice?…get the two-person; just a little heavier than the one person, but oh so much more room. Sleeping bag. Choices, choices. You’ll want at least a 30-degree bag even for Steamboat. More if you’re a cold sleeper. Last year in Walden it got down to 25 degrees. In July. Down packs smaller, though synthetic retains it warmth better when damp. It’s about loft and trapping your body heat when it comes to sleeping bags. Big Agnes does have some cool down bags treated down that retains loft, even when damp. What the best for bikepacking? Get the Flume UL 30 and be done with it. Sleeping pad. Side sleeper? Stomach sleeper? Back sleeper? If you’re a side sleeper go for something wider and thicker to manage the pressure points caused by your shoulders and hips. Stomach sleepers also benefit from a wider, thicker pad. Something like a 25″ wide Q-Core Deluxe is what you’re after. If you’re a die-hard back sleeper you can get away with something not as thick and usually not as wide unless you move around (and then check out the bag/pad system that Big Agnes is known for). An Air Core Ultra is a good example of a great back sleeper pad. Whatever you do, don’t skimp on a pad as a good night sleep is critical. Do your research and be honest about how you sleep. Ride kit. The Ramble isn’t the time to try to go without a chamois unless you’re used to it. A bib or short and some sort of casual over-short is a popular choice. Giro makes great choices for women or men. A more casual riding shirt or jersey gives you the benefit of performance materials and still keeps some of the cycling functional bits like rear pockets. But a flannel shirt is always good for style points. Don’t forget a riding jacket for weather and gloves if you use them. Snow is always a possibility on the Ramble. We love epics. Cycling shoes. Yes. But let’s be clear: we’ve had folks ride these rides in everything from sandals to road shoes. Flats (non-clipped shoes and pedals) are becoming more popular on these rides and our recommendation is to ride something made for cycling that has a stiffer sole. Hike-a-bike isn’t out of the question so something like Giro’s Terraduro is a great choice. Helmet. Your mom called and she said don’t forget your helmet. Bring one, anyone, you have. And wear it. You know who makes great helmets? Giro does that’s who. Come on the Ramble and I’ll tell you how their helmets saved my brain twice. And one time involved a goat. Now you’re curious. Bags. Or as we say in bikepacking, the nitty-gritty. Medium Seatpack. Perfect size for a Ramble and short trips. Easy access to grab an item fast. Frame Bag. If you’re using a reservoir, it goes in here. Plus all the other things you can’t be without. Handlebar Roll. A typical place for items you won’t need on the ride. Think sleeping kit. Comes in two sizes, and the small fits drop bars. Tube Bag. A smaller solution for essentials: camera, phone. A phone that is a camera. Sunscreen. Food. Essentials. You can see the whole Ortlieb line here. You know what you need better than we do. Keep it small, however. Any showers available on the route? Yes, at least two days depending on the direction. Showers are available in Walden, Steamboat, and Fort Collins.